This 5 gallon aquarium kit features rounded corners and a clear glass, sliding canopy to give you a beautiful view of your fish. The hinged light and sliding glass canopy allow for easy access to the tank. 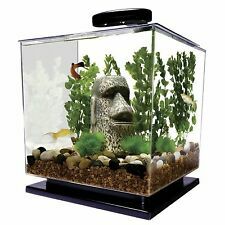 I opened it and was planning to use it however i went with a different aquarium. 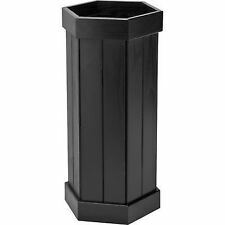 Tetra LED Cube Shaped 3 Gallon Aquarium with Pedestal Base BRAND NEW!! The Tetra Cube Aquarium Kit is the perfect starter aquarium for kitchens, dormitories, classrooms, and offices. The 3-gallon kit fits almost anywhere! The sleek and seamless tank is as transparent as glass and provides a unique and exciting panoramic view of your personal underwater habitat. 4.5 out of 5 stars - Tetra LED Cube Shaped 3 Gallon Aquarium with Pedestal Base BRAND NEW!! 25 product ratings25 product ratings - Tetra LED Cube Shaped 3 Gallon Aquarium with Pedestal Base BRAND NEW!! For freshwater use only. 7500K LED lamp supports plant growth & enhances fish colors & fully adjustable white RGB LEDs for endless color blends. Where applicable, electronics and plugs work with standard US 120 volt, 60Hz outlets, unless specifically stated otherwise, above. Easy to set up and maintain, this trendy fish tank will look good wherever you place it. This is the perfect starter tank for guppies and is much easier to maintain than a 10 Gal tank that many people start a hobby keeping fish. Florescent light works great.and front of cover hinges up for feeding fish. Our primary warehouses are in PA, TN and AZ. Easy feed top cover opening. Multi-directional dual outputs for customized water flow. Fully adjustable White RGB LEDs for endless color blends. 6.8 Gallon Starphire Ultra-Clear Nano Cube built by Waterbox. Waterbox has created the ultimate rimless cube aquarium system constructed from Starphire Ultra-Clear™ with carefully beveled edges to provide the best visually appealing cube aquarium on the planet. The Fluval Flora aquarium plant kit includes everything you need to grow a thriving. Fluval Aquarium filter. Fluval Flora Planted Aquarium Kit - YouTube. Aquarium Capacity : 14.5 US GAL (54.8 L). Glass aquarium. 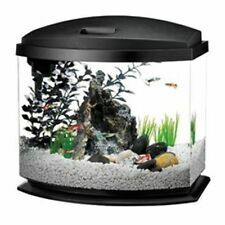 Introducing the NoClean Aquariums GravityFlow2 Fishbowl: It's self-cleaning, eco-friendly, and only takes about 60-seconds to work! 1 x GravityFlow2 Self-Cleaning Fishbowl. People love aquariums because of their soothing, natural beauty. Aqueon Versa-Top Hinged Glass Top 24in x 12"
Each Versa-Top features a clear vinyl back strip that can be easily cut to custom fit your accessories. Where applicable, electronics and plugs work with standard US 120 volt, 60Hz outlets, unless specifically stated otherwise, above. All Dog Treats. 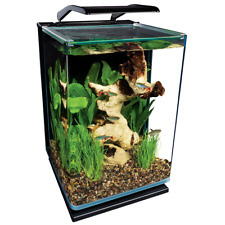 The Marineland 5 Gallon Portrait Kit is a five gallon curved glass aquarium. The bright white and blue energy-efficient LED light is hinged for easy access to the tank, and features a 3-way switch to toggle between white and blue, off, and blue-only settings. Aqueon products ONLY work with other Aqueon products. Keep fish and water in your aquarium where they belong. Features a clear vinyl back strip that can be easily cut to custom fit your accessories. Versa-Top 24 from Aqueon. Each Versa-Top features a clear vinyl back strip that can be easily cut to custom fit your accessories. Black Superflex hinge. Includes handle. The filtration system ensures your water stays healthy and clean for both your fish and live plants. Where applicable, electronics and plugs work with standard US 120 volt, 60Hz outlets, unless specifically stated otherwise, above. A crystal clear glass canopy provides the area for your lighting to sit while allowing easy access to your tank. A crystal clear glass canopy provides the area for your lighting to sit while allowing easy access to your tank. Where applicable, electronics and plugs work with standard US 120 volt, 60Hz outlets, unless specifically stated otherwise, above. Save Big On. All Dog Treats. A ll of which are used from the set up. RAN THIS SETUP WITH OPEN TOP. Heads up, this is essentially a high quality all in one used mini fish aquarium suitable for many types of fish. LITTLE TO NO SCRATCHING ON OUTSIDE OF GLASS. The Aqua Culture 20-Gallon Aquarium Starter Kit is a great way to add a touch of nature to your living spaces. 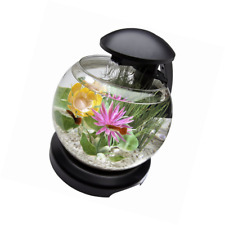 This kit includes a Tetra internal filter that provides powerful, yet silent filtration to keep your fish healthy and the water crystal-clear. The Aqua Culture 10-Gallon Aquarium Starter Kit is a great way to add a touch of nature to your living spaces. This kit includes a Tetra internal filter that provides powerful, yet silent filtration to keep your fish healthy and the water crystal-clear. 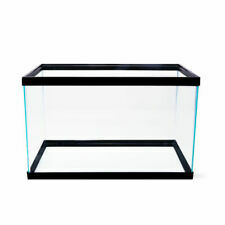 Constructed of high-strength silicone glass that provides a permanent watertight seal, this 10-gallon tank makes the ideal starter aquarium or terrarium for a wide variety of fish and reptiles. Simply add accessories, a pump, and your species of choice to get the fun started. (2)Translucent brown plastic self-adhesive backed handle for all size All-Glass/Aqueon aquarium canopies. The 10 Gallon Fish Tank Aquarium Clear Glass Terrarium is the perfect starter aquarium or terrarium for a wide variety of fish and reptiles. Fun for all ages, the versatile glass enclosure is made with high-strength silicone, which creates a permanent water-tight seal. Lighting is provided by the powerful 37 LED lamp with an arm that connects securely to the side of the aquarium. The energy-efficient LED lamp provides brilliant plant and decor illumination. The 83 GPH pump and filtration system are conveniently located in a separate chamber hidden behind frosted glass at the back of the aquarium, simplifying maintenance. This fascinating enclosed world 3 to 4 marine shrimp, algae and micro-organisms. The Ecosphere only needs indirect light and comfortable room temperature. The Ecosphere works on the basis that a closed system recycles its nutrients and does not produce excess waste. MarineLand 5 Gallon Portrait Glass LED Aquarium Kit. Condition is New. Shipped with USPS Priority Mail. 10 Gallon Rimless Aquarium. Condition is new perfect for starters or the seasoned aqua scaper. Condition is Used. Small glass bowl. Aquarium Kit 5 Gallon Led Lighting Fish Home Tank Glass With Filter Advanced 3-stage hidden back panel filtration with adjustable flow filter pump. The white LEDs create a shimmering light in the water. The blue LEDs produce a relaxing moonlight glow. Includes a hinged light and sliding glass canopy for easy access to tank. Portrait 5-Gallon The Marineland 5 Gallon Portrait Kit is a five gallon curved glass aquarium. Constructed of high-strength silicone glass that provides a permanent watertight seal, this 10-gallon tank makes the ideal starter aquarium or terrarium for a wide variety of fish and reptiles. Pair with an Aqua Culture Screen Cover for a turtle tank or hermit crab habitat, or use an Aqua Culture LED Aquarium Hood for fish and aquatic pets.This versatile aquarium is easy to set up and provides fun for all ages. This is a Fluval Edge 12 gallon aquarium setup with all accessories and extras. This setup was done right and includes Fluval E100 advanced electronic heater with digital display and LED color backlighting. 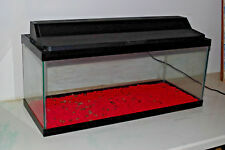 The Aqua Culture 20/55 Gallon Aquarium Hood will work on any compatible 20 or 55-gallon tanks. The LED bulb is long lasting, so you can enjoy it longer without the need for frequent bulb changes. The Aqua Culture 20/55 Gallon Aquarium Hood is low-profile, so it won't be top heavy on the tank to promote greater stability. 1 X Creative hanging glass vase fishbowl. Color: Transparent. Material: Glass. Item Size: 14.2 10 10cm.